All was good, the owner was friendly, the rooms was clean and the sky bus is near. Perfect to go with friends. It’s very warm, close to a mini market and a very nice little restaurant, has a bus down the road which takes you to the Kopaonik centre. The host Dragan is very nice and accommodating, and has recommended one of his sons as a ski instructor. Milan Petrovic was an awesome ski instructor for our kids, had great recommendations for the area and put us in contact with an excellent ski hire place at very good rates. Having wifi at the property was fantastic! When we arived, the door was open and the fire was set. The kitchen is equiped with almost everything. The bathroom is warm. There is a minimarket under the cabin. Excellent location right in front of the bus stop, above a supermarket, and right next to a restaurant. Great view, comfortable, clean, the ambient inside is suitable for mountain places, when we arrived it was very warm and wifi was good. A főút mentén, közvetlenül egy bolt mellett helyezkedik el. Szép a berendezés. Reggel átvehettük a kulcsokat, hogy az érkezés napján is tudjunk síelni. Lepo, čisto, udobno i toplo! Vlasnik objekta ljubazan i na usluzi. Deca vlasnika objekta su instruktori skijanja, tako da smo ugovorili i obuku, a kao gosti objekta smo dobili i popust na iznajmljivanje ski opreme. Više smo nego zadovoljni! Vila Milica This rating is a reflection of how the property compares to the industry standard when it comes to price, facilities and services available. It's based on a self-evaluation by the property. Use this rating to help choose your stay! 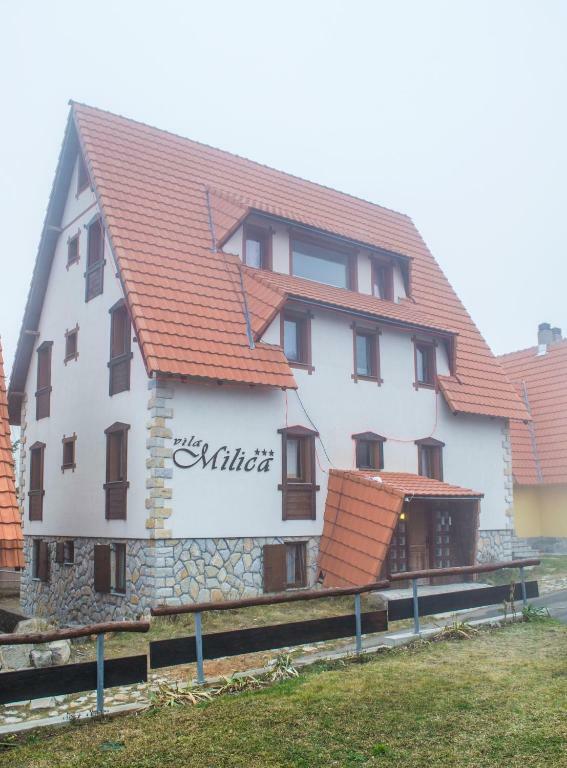 Boasting panoramic views from its position at 4,593 feet above sea level, Vila Milica features an on-site grocery shop and traditionally decorated accommodations with cable TV. Each accommodations unit has an individually controlled heating system, a bathroom with shower, and a kitchen including a fridge and stove. Kopaonik Ski Center is 1.2 mi away. It features 25 mi of ski tracks as well as several restaurants and bars. The property is just off State Road 218a connecting Kopaonik with the town of Raška. A restaurant serving Serbian specialties is just 150 feet away. Canoeing is possible on River Ibar, 12 mi away. Several historic monasteries can be visiting within a radius of 19 mi. When would you like to stay at Vila Milica? Features a fully equipped kitchen and a living room with a leather sofa bed, while the bathroom comes with a shower cabin. Featuring a living room with sofa bed, fully equipped kitchen, and a bathroom on the ground floor, this unit also has 3 bedrooms on the upper level and another bedroom in the attic. House Rules Vila Milica takes special requests – add in the next step! Availability of free parking places in winter. There is no private parking, but can find along the road a place to park most of the time, but the snow is not cleaned, so you better carry a shovel. Just 1 property key for entire groups. You have to take a cab by night to go to the ski center for pubs and more or to use your personal car (and don t drink alcohol). Almost 1.000 dinars for night cab to ski center for party and 1.000 dinars to return (if you are 4 people it is ok). Ask for cab at supermaket or wait for one. A single bathroom for ten people is not enough. The top floor access is a little inconvenient. No towels were available, maybe it said in the description, but had not noticed. The staff doesn’t know english, but they managed to comunicate afterall. A search for parking because on the side everything was taken, but when traffic on the road was cleaner we moved the car closer to the place.